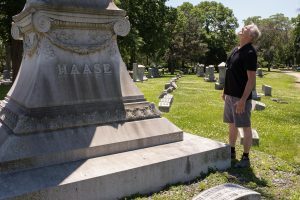 The great-grandson of an early Proviso pioneer visited the Forest Home Cemetery founded by his Prussian ancestor on the edge of the Des Plaines River June 7. 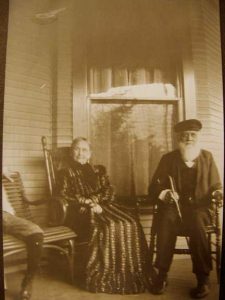 Ben Brooks and wife Clarissa from Pasadena Calif., met up with members of the local Historical Society of Forest Park (pop. 12,000), bearing never-before-seen photographs and documents. Brooks is one twig on the family tree of the descendants of the Hasse family, Ferdinand (1826-1911) and Wilhelmina (1829-1915), who purchased 40 acres in 1851 from the area’s first European-derived settler, Leon Bourassa. 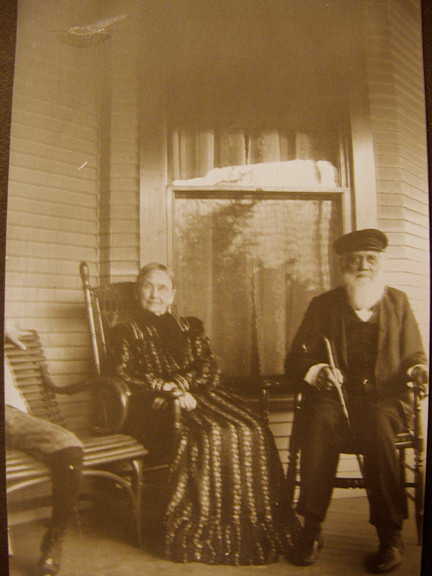 The Haases raised eight children in the town, which was called Oak Ridge, Noyesville, Harlem, and finally Forest Park. The Haase’s original farmland, now the cemetery, is situated on a geological sandbar called the “Oak Park Spit,” that marks the banks of the prehistoric proglacial “Lake Chicago,” a watery ancestor of Lake Michigan. At the cemetery, the Brooks’ visited the family’s ancestral obelisk and tried to map out ancestors with a family tree chart they brought along. The Haase patriarch paid $12,000 for the land, on a high-interest mortgage, his son wrote. 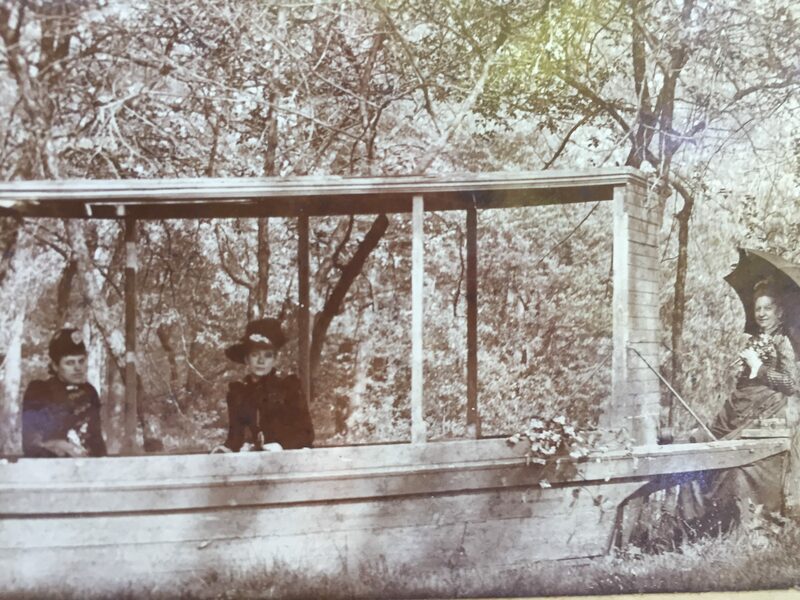 Chicagoans began to visit from the city to picnic in the woods and visit the river, where tourists were shuttled up and down on the White Swan pleasure boat. The family eventually owned more than 240 acres. Times got tougher and the Haases began to sell off land to the Concordia Cemetery company. By 1871, the year of the Chicago fire, they had sold off 160 acres for $46,000. The family returned to Germany for a visit and returned financially lighter, with money lent to friends and family who never repaid. Then the family got involved with an unsuccessful bank. It was the Haase’s first financial crash. “How to get a new start was the problem,” Leo’s narrative continues. 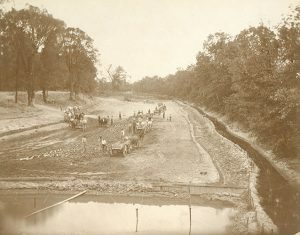 Haase said he and his mother used their imagination to figure out how to sell gravel and sand, which ended up used to make concrete and plaster for the building boom following the Chicago fire. They also opened up the cemetery with a charter granted in 1871. The soft, sandy ground was easy to dig, and in fact the Pottawattamie wife of first settler Leon Bourassa legendarily stayed behind to tend the Native American graves when her tribe members left the area. 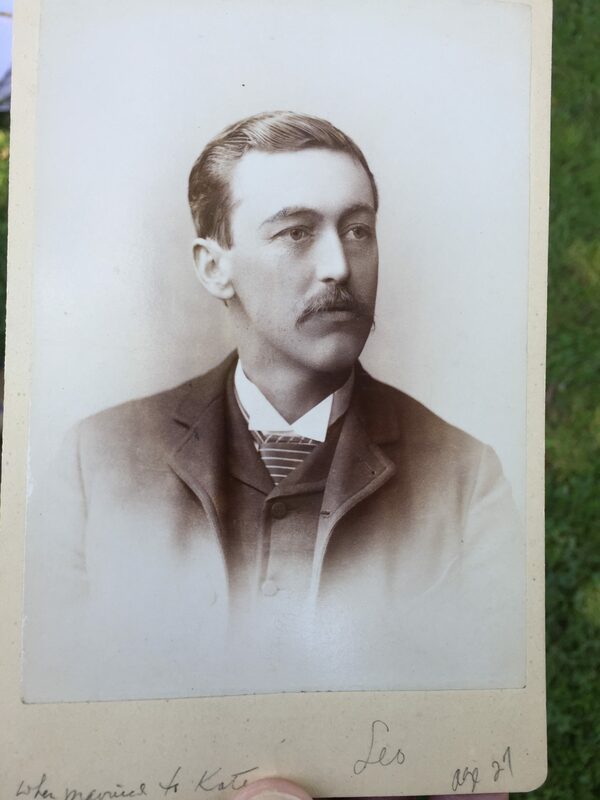 Leo got involved in Proviso politics at age 21 and was elected highway commissioner and then village clerk. “We levied the taxes and built all the roads and bridges,” he wrote. Ben Brooks’s grandfather also was handy at inventions, including a special gravel sorting machine, a human-powered circular dredger for the river when it flooded and a special snow plow that brought customers from Chicago to the cemetery on ploughed roads. He created an irrigation system for the cemetery. 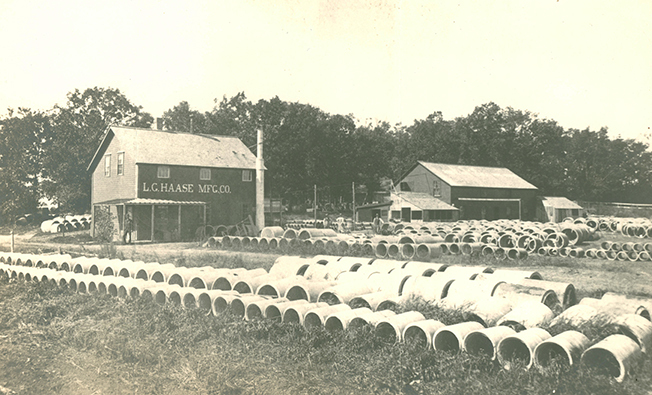 Forest Home had the first telephone in the area when Leo paid $600 to have a line spurred off from the main line connecting Chicago and the Maywood Tin Can Factory. As Chicago boomed, the deceased were no longer buried within city limits. 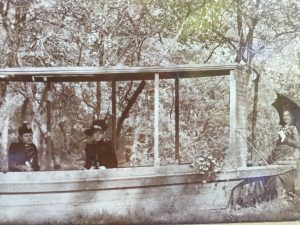 A special funeral car was created on the railroad line to bring the dead and their loved ones to the Forest Park cemeteries. The Hasse’s created a “Perpetual Care Fund” in 1880 for maintenance of the grave sites. “Business grew by leaps and bounds, so that Polly used to carry the money to the city office by satchel-full,” Leo Hasse wrote. The cemetery business grew as did the gravel and cement business. The two finally converged with the Wilbert Vault Co. (named after the Haases’s youngest son Wilbert), which manufactured cement burial vaults. The company took off when they sold funeral vaults during Chicago’s 1918-919 influenza epidemic. 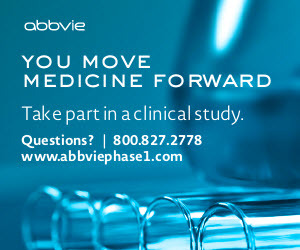 Chicago, like the rest of the country was hit hard by the epidemic and the city saw 8,500 flu-related deaths in a span of eight weeks, according to the company’s website. The cemetery, with its anything-allowed approach to monuments drew a wide range of residents-at-rest, including Clarence and Grace Hall Hemingway (Ernest’s parents) and temperance preacher and baseball star Billy Sunday. The cemetery also held the Haymarket Martyrs monument, and mass graves of victims from several of Chicago’s great disasters including the 1915 Eastland Disaster, the Iroquois Theater fire and the influenza epidemic. 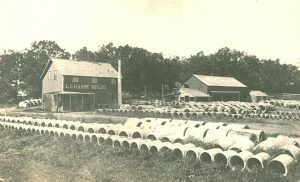 Leo G. and his wife Katherine (1871-1921) moved his family to California in the early ‘teens to escape the wet weather and the company made another fortune creating tubular cement vaults for underground water meters in California cities. “Fifty years ago I adopted the slogan, ‘No second rate material shall ever leave these works,’” Hasse wrote in 1928. On his Chicago–area visit, Leo’s grandson and his wife met Anthony Calderone, mayor of Forest Park, whose family has lived in the town for more than 100 years. The Brooks’ viewed an historical society exhibit about the Forest Park Amusement Park, which flourished in the early 20th Century until Prohibition and a fire killed the business. “This is so interesting. I can’t believe I never came here before,” Ben Brooks said. But just like his California-based grandfather, he imagined he would never make it through a Chicago winter. “I don’t think I could handle the weather,” he said.